50 Wonderful Things From 2017 It's cold outside, but we've got 50 Wonderful Things from 2017 listed on our blog. Plus, the Pop Culture Happy Hour panel digs into some of the stuff that made it a year worth watching and reading. 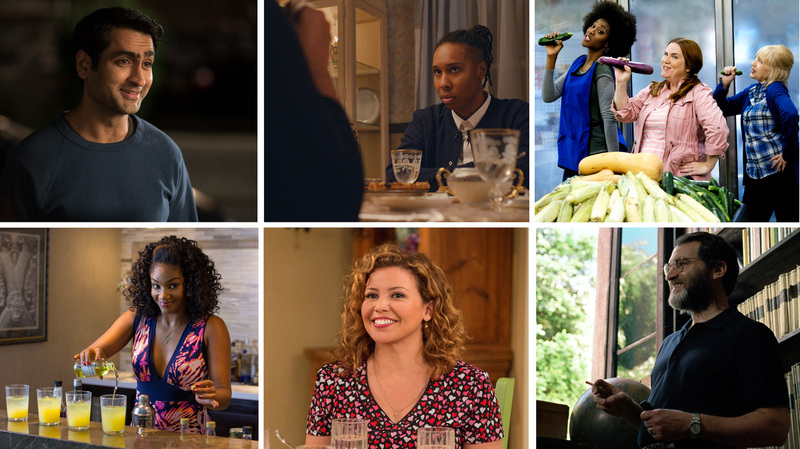 The Big Sick, Master Of None, Crazy Ex-Girlfriend, Girls Trip, One Day at a Time and Call Me By Your Name. Standard caveats: I don't watch everything! I am behind on many things. That's just the way the world is. So if something you loved isn't here, it is not a rebuke. And: These are cultural — mostly pop-cultural — things. These are not the best things in the world. Like yours, my actual list of wonderful things from the year, if I wrote it in a journal instead of for work, would be a list of people and moments spent with them, of days when it was unexpectedly sunny and of the times when things suddenly felt better. But whatever journey you're on at any given moment, you can always use more good things. So here we go. 1. Jake Gyllenhaal's work in Stronger. Stronger is about Jeff Bauman, whose lower legs were amputated after the Boston Marathon bombing in 2013. A film like this — a biopic, an apparent hero story, a story involving disability, a story about the aftereffects of terrorism — has a hundred hackneyed traps to avoid falling into, and the trailer unfortunately suggested that it would tumble headfirst into every one. But Gyllenhaal imbues Jeff with an ordinary temperament and ordinary problems that are not solved, to say the least, by sudden public attention. He, along with Tatiana Maslany as Jeff's girlfriend and Miranda Richardson as Jeff's mother, under the direction of David Gordon Green, make a far more complicated film than I expected. It is about the effects of personal rather than national tragedies, and the ways families adapt, compromise by sometimes-grueling compromise. 2. Holly Hunter brings her steeliest self to the parts of The Big Sick — in which she plays Beth, the mother of the seriously ill Emily — where she nearly beats up a heckler at a comedy club and faces off with doctors. But the performance brings out new things in Hunter, too. I'm particularly fond of a moment when Emily's estranged boyfriend comes to the hospital to visit and begins to explain who he is. She turns around and says, "We know who you are, Kumail." In that sentence, she says that she knows exactly how hurt Emily was by the breakup, that she blames Kumail for it, that she doesn't expect him to be there and doesn't think he should be, that she's not looking for a fight, that she lacks the energy for much of a conversation, and that she doesn't want him to tell her how sorry he is. But the words are "We know who you are, Kumail." 3. Timothée Chalamet in Lady Bird saying he doesn't really believe in money. A better portrait of the high school privileged purely theoretical socialist you will not find. Bless you, Greta Gerwig. 4. The romantic-comedy-inflected Black Mirror episode "Hang The DJ." I can't say much yet — it will be out on Dec. 29 — but it is a new direction for the series and I adored it. 5. All of Netflix's reboot of Norman Lear's '70s sitcom One Day At A Time delighted me, but all it took to get me excited about season two was to hear the Gloria Estefan version of the theme song. 6. Get Out is a gimme on a list like this: scary, brilliant, funny, packed with wonderful performances from Daniel Kaluuya and Betty Gabriel and Catherine Keener and (deep breath here and just keep going). But the keys ... the keys. The moment with the keys. 7. The most physical performance I saw in theater this year was from Tony winner Ben Platt, whose portrait of a kid seized by anxiety — paralyzed by it — in Dear Evan Hansen contained truckloads of truth to me. 8. The season premiere of Black-ish tried to do a lot with a half-hour episode: It's a musical, it's about Juneteenth and it brings the show back from a break. But for the most part, it worked very well. Few network sitcoms have taken time to list just some of the many things built with slave labor, let alone set them to music. 9. Mike Birbiglia's special Thank God For Jokes, made available on Netflix this year, is funny and big-hearted and physically creative; kind of a cross between a comedy special and a one-man show, and often quite touching. 10. Speaking of unconventional comedy specials: Hasan Minhaj's Homecoming King is great and funny, but also does a better job than almost anything I've seen of incorporating social media into a visual presentation without looking like one of those movies where computers display lines of text one letter at a time. 11. When your organization has a contest and you're helping spread the word about the winner, you can only hope your enthusiasm will be as genuine as mine was when Tank and the Bangas won the Tiny Desk Contest. 13. Paula Vogel's play Indecent ended its Broadway run in August, shortly after winning two Tony Awards (including one for director Rebecca Taichman). But its use of light and imagery, including an unconventional beginning and a breathtaking use of costuming as a symbol of history, will stay with me. 14. Difficult losses that happened in 2016 continued to echo in 2017, as when Carrie Fisher's last performance as Princess Leia reached us in Star Wars: The Last Jedi. How fortunate, then, that while Leia may not have been able to complete her story as originally planned, she built upon her decades of history with her great love and with Luke, who first found her as a captured princess and came to know her as a fearless general. 15. Holiday episodes of episodic TV shows can easily become throwaways; not so the Emmy-winning "Thanksgiving" episode of Master Of None, written by Aziz Ansari and his co-star Lena Waithe. Waithe's new show, The Chi, comes to Showtime in early January. 16. You may never have seen a movie as obsessed with architecture as the quiet and unassuming Columbus, in which John Cho and Haley Lu Richardson build a bond that exists both literally and figuratively in the shadows of the great modern buildings of Columbus, Ind. 17. Salma Hayek wrote a searing op-ed for the New York Times called "Harvey Weinstein Is My Monster Too." But the best evidence this year of what she stood to lose as an actress, and what film stood to lose, was her subtle performance in Beatriz at Dinner, an uncomfortable, intelligent, strange film about wealth in the world. 18. Not everything about the action movie Atomic Blonde quite worked, but you know what worked perfectly? The costumes, as chosen by Cindy Evans. It is almost possible for a film to be so stunning to look at that its inconsistencies cease to matter. 19. Netflix series American Vandal is strange and sad and funny and smart about high school, but at its center is the stubbornly inscrutable performance of Jimmy Tatro as Dylan Maxwell, a high school student to whom there might be more than meets the eye — but maybe not? 20. One of my favorite tweets of the year was just Channing Tatum and Roxane Gay. Hanging out. Still don't know why. 21. Hari Kondabolu's documentary The Problem With Apu took on the use of a racist caricature on The Simpsons, a show that is beloved not only by much of current comedy royalty — who grew up with it — but also by Kondabolu himself. 22. OK, look. Darren Aronofsky's mother! was not everybody's kind of movie. It definitely has a lot of overwrought, weird things in it. But the first half is less reliant on body horror crossed with religious references and more reliant on how profoundly unsettling it is when people simply don't behave according to social expectations — when people trespass both physically and behaviorally. And that half, highlighted by the growing fears of Jennifer Lawrence and the cold intrusions of Michelle Pfeiffer, works as it should. 23. "The Oscars are boring." This is not always true, but it is often true. The announcement of best picture is one of the places where it is most likely to be true. Except, of course, if someone hands the wrong envelope to Warren Beatty and it makes it to Faye Dunaway, who is so steeped in her on-with-the-show ethic and so averse to freezing on stage that she simply announces that La La Land, the overwhelming (and by now resented) favorite has won, when actually Moonlight, the little movie that could, has won. And then, the people who made La La Land have to announce from the stage that they have to give back the Oscar. If you imagine Johnny winning the fight at the end of The Karate Kid and then Daniel doing the crane kick while Johnny is getting his trophy? It was a little like that. 24. Lucy Parker's Pretty Face is the perfect contemporary romance novel for people who like their romances smart and a little offbeat. 25. It's not wrong that so much of the love of Girls Trip has been about Tiffany Haddish, who stormed that movie and took no prisoners. But what I always remember is the fight: the big fight, worse and worse, that only happens among people who truly, honestly love each other. 26. The animation in Coco, Pixar's film set around Dia de los Muertos, is done with great love. Never more, perhaps, than with Coco herself, who represents both the difficulties and losses of aging and the resilience of the self in spite of those losses. 27. People from comedy and other arenas continue to do great work talking about the difficulties of mental illness — depression particularly. One 2017 standout was Chris Gethard, whose HBO special Career Suicide was funny but also honest and painful. 28. Films purporting to explore what life is like for poor people in the United States often fall into pity or draw maudlin portraits of noble struggle. Sean Baker's The Florida Project does neither. It lives in the largely carefree stride of young Moonee (Brooklynn Prince), but also in the thankless hustle of her young mother (Bria Vinaite), who wants desperately to do better for herself and her kid and finds it profoundly difficult. 29. Marvel, rather than adding another muscle-bound Chris to the world of superhero movies, went with Tom Holland — who actually looks like he might be in high school — to play Spider-Man. The first full-length result, Spider-Man: Homecoming, could have used a more fully realized villain. But the creation of Peter Parker's world, his friends, his school, and his attitude toward becoming Spider-Man set the stage for more adventures. 30. You don't realize how rarely you're caught entirely off-guard by a plot development until it happens. Late in the coming-of-age romance Call Me By Your Name, 17-year-old Elio's relationship with his parents evolves in an unexpected way that changes the tone of the story and leads to a scene with Michael Stuhlbarg as Elio's father that will go down in film history as one of the great Dad Talks. 31. This anatomically specific song from Crazy Ex-Girlfriend about running into an old boyfriend. 32. The podcast Reply All — probably my favorite reporting-based show — made a trip to India this year to trace the origin of a scam tech support call, and while some elements of it were as expected, some emphatically were not. 33. Cate Blanchett's antlers in Thor: Ragnarok. 34. It's hard to name the best visual joke in the increasingly weird and great NBC comedy The Good Place, but it may well involve the work of D'Arcy Carden, who plays a robot that, among other things, spews pennies out of her mouth when she's "glitching." 35. As fond as I've always been of John Hodgman's weird fake trivia books, his new-ish book Vacationland, which is true and funny and sad and strange, is probably as close as he'll get to putting his writerly essence into one volume. And a fine — and kind — piece of work it is. 36. A book of short stories by a celebrity can easily come off as a vanity project, made possible by the absence of anyone willing to say no. But Tom Hanks' collection Uncommon Type contains a number of fine tales, including "A Junket In The City Of Light," a story of breathless and meaningless press appearances that will make you think differently about every interview you've ever seen in which a famous person appears to have forgotten how to behave in a moderately human fashion. 37. It was a fine year for internet dogs — although really, every year is a fine year for internet dogs. My favorites in 2017 included Gordon Lightfoot, a dog who lives in Hawaii with Canadian parents (obviously), and who valiantly learned to walk on three legs this year after one was amputated. His first Instagram appearance after his surgery filled my heart with love and the feeling that dogs are truly great. 38. Every year at the Toronto International Film Festival, I see something that doesn't take off, but that I still really like. This year, it was Brie Larson's directorial debut, Unicorn Store. It's really weird and fun and it's always teetering on the brinks of several disasters creatively, but I felt like I got it, like I got why it was made. And if you haven't already heard me say it, Mamoudou Athie is the romantic comedy lead I have seen twice and loved twice in romantic comedies and entirely too many people have not seen in a romantic comedy at all. 39. There is a moment early in Frederick Wiseman's three-hour documentary Ex Libris: The New York Public Library when the film shifts its focus from the familiar grand library with the lions out front to a small branch where kids are getting help with their homework. And in that moment, you realize that what Wiseman is getting at is the very sprawl of the library as a cultural institution: it is a gathering place for intellectuals and a magnet for wealthy philanthropists, but it is also its reach, its practical points of contact with New Yorkers with all kinds of needs. Do not fear a three-hour library documentary! It is one of the great films I've seen about New York. 40. Not only is Adam Driver very good in Star Wars: The Last Jedi; he was very good in Logan Lucky, Steven Soderbergh's knockabout NASCAR heist movie. But as good as he was, the highlight of Logan Lucky — and this is true — involves Game Of Thrones. Just ... see it. 41. The Wonder Woman fight scenes, creative and innovative in their choreography, created one new way for a superhero to look. There are plenty of images still to be effectively drawn, but it made for quite a Halloween. 42. Did Baby Driver hold up very well for me? It did not. Do I dispute that Edgar Wright staged a heck of an opening sequence not like any I'd seen? I do not. 43. My favorite unexpected theatrical experience was attending Derek DelGaudio's In & Of Itself, a storytelling show that's also a magic show that's also sort of a ... humanity seminar? It's very hard to explain, but if you do yourself the favor of attending, there will come a moment in which you will feel seen in a way that will surprise you. 44. It's hard to declare the Hulu production of A Handmaid's Tale ... wonderful. It's terrifying and awful and often violent. But its insistence that a slide into a society you currently cannot imagine is always shorter and more slippery than you expect makes it feel essential. 45. The CW's Jane The Virgin began with a fairly straightforward love triangle that developed into a lopsided love story and has transformed again this season. Because Jane is, particularly in its current form, so sparing in its indulgence of Jane's romantic fantasies, when they do intersect with her reality, they're all the more swoonworthy. 46. Basically everything Seth Meyers did with "A Closer Look." That's a funny, funny bit, and they've really let it fly. 47. The "Christina" episode of the Gimlet podcast Heavyweight. 48. The Another Round episode "I Got Indian In My Family." 49. My favorite contestant, Brooke Williamson, won a season of Top Chef. 50. Everyone kept going, kept creating and sharing, and kept reading and watching and listening to what they love. Creativity is a glorious thing, so thanks to everybody.